There’s a lot to manage when running an email campaign. Today you’ll learn strategies to set yourself up for success. You can improve your campaigns, by testing your emails, creating relevant campaign landing pages, and measuring the success of all your hard work! First, let’s discuss how you can use something we call, A/B testing to get more people to open your emails, and click through to your website. A/B testing, is when you create two versions of an email to see which one performs better. 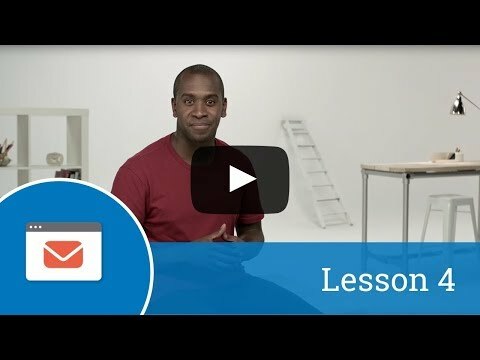 You can use this technique to test different email approaches. Let’s say you are sending an email announcing a new product, but you’re not sure what subject line to use. You can send half of your customers, Version A of the subject line, and the other half Version B. Then, look at which email had a higher “open rate”. That is the measure of how many people open your emails, compared to how many emails were delivered. Whichever version had a higher open rate, wins! You can use A/B testing to test different subject lines, frequency, content and images. You could try sending emails on Tuesdays and Saturdays. Or, try sending emails weekly and monthly. See what your audience seems to prefer, and then adjust. Keep in mind, that you don’t want to overwhelm people by sending them too many emails. You should always provide the option for people to receive fewer emails, such as a monthly digest. That way they don’t unsubscribe, simply because they want to hear from you less often. Be sure to choose—or create— specific landing pages for your email campaigns. A landing page is the first page a person sees when they arrive at your website. That way, when a person clicks a link within the email, they’ll “land” on a relevant web page. You wouldn’t want someone to click a link to learn about a specific product and end up the homepage, right? Your email campaigns will be more successful if you send visitors directly to the page they want to see, so they can learn about the product, and maybe buy it! Last, remember that people will read your emails, on mobiles, tablets, laptops, and desktops. That means your email landing pages need to work well, across all those devices. Just like any type of online marketing, email marketing is easy to measure. Email services usually include analytics tools, so you can track and measure how well your campaigns are doing. The reports can show you interesting data like “open rates,” which can help you learn which subject lines are most compelling. You can see which content drives people to visit your site by looking at the “clickthrough rate,” when people click a link within the email. And finally, be sure to use web analytics to figure out what people are doing on your website, after they click on your emails. As always, you should be looking for opportunities to improve the website experience for email visitors. Let’s review. You can regularly improve your email campaigns, by testing different versions, creating relevant landing pages and using analytics to see what’s working best. These tips will set you up for success and help you understand the value of your email marketing campaigns.